A fragrance named after a fictional thief? Possibly Jean-Paul Guerlain's last fragrance? A leathery oriental? I had to try Guerlain Arsène Lupin Dandy. While I waited for my decant to arrive, I boned up on Arsène Lupin. Maurice LeBlanc created Arsène Lupin in 1905 as the antihero of a series of short stories. Lupin is a sybaritic thief with a keen eye for furniture, paintings, jewels, and pretty ladies. He plans his heists more for the challenge than the loot. In one typically Lupinesque caper, he writes to a Baron who lives in a heavily guarded mansion on a rocky island in the middle of a river. He instructs the Baron to deliver certain of his treasures to him by a particular date or he'll steal them and more. (He adds not to bother with the larger Watteau in the dining room, because it's a fake, just in case the Baron isn't aware.) The clincher is that Lupin writes the letter from jail. The Baron refuses Lupin's request, and even hires protection for the night Lupin threatens to break in. Sorry Baron. Hope you were insured. LeBlanc's Arsène Lupin stories were hits, so LeBlanc branched into Lupin novels, including one pitting Lupin against Sherlock Holmes. A friend lent me the 1910 English version, and I haven't finished it yet, but so far Holmes isn't looking good and Watson is made out to be a real dunderhead. The novel irked Arthur Conan Doyle so much that he threatened to take LeBlanc to court if he persisted in using Sherlock Holmes' name. As a result, look for the novel under the title Arsène Lupin versus Herlock Sholmes. At last my decant of Arsène Lupin Dandy Eau de Parfum arrived. The clear bottle showed pale purple liquid. Guerlain lists Arsène Lupin Dandy's notes as bergamot, pink pepper, cardamom, violet, incense, cistus, leather, and patchouli. For once, a list of notes matches how it smells on skin. Dandy's peppery bergamot kicks off the fragrance like the loud fanfare starting a race. Except this race features a lot of sitting around in a library sipping Turkish coffee and reading leatherbound books. After a bracing two seconds that had me fearing a manly fougère, Dandy quickly shifted down into a warm, cardamom-infused floral bolstered by quiet leather turned skin-like by musk and a hint of patchouli. The combination of cardamom and violet almost smells like tea as it warms on my skin. The violet isn't the violet of candy and face powder, but is fresh and green. Tonka's creamy sweetness grows over the first quarter hour, reminding me Dandy is a Guerlain. I can almost smell a pinch of cocoa powder, too. Despite all this talk of leather, cocoa, and cardamom, Dandy never feels heavy. In that way, it reminds me of Annick Goutal Duel, another fragrance replete with warm, spicy, leathery notes that remains bright and fresh. Dandy wears close to the skin, too — maybe a little too close for my taste. You could easily wear three or four sprays to work and not have anyone further than the other side of your desk notice it. But I guess if you're a cat burglar, that's the way you want it. 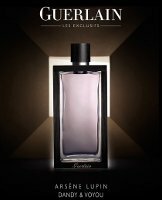 Guerlain Arsène Lupin Dandy is part of the Parfums Exclusifs collection and is available in 100 ml Eau de Parfum. For information on where to buy it, see Guerlain under Perfume Houses. Note: Arsène Lupin Dandy is one of a duo; see also Arsène Lupin Dandy Voyou. Thanks for reviewing this, Angela! I’ve been curious about it. Would you call it a masculine or unisex? I’m glad you asked! I should have put in the review that Dandy is firmly unisex after the first two seconds. Wonderful review, Angela, of both the books and the fragrance! I’ve been reading Georgette Heyer’s mystery novels (English, 1920’s) and now I want to check these out. The bracing opening that had you “fearing a manly fougere” has kept me from going any further than sniffing it in the sample vial! Chicken me! So now I’ll get brave and apply it to skin. It sounds like it might be nice for Spring (she says as she watches giant snowflakes fall). Ooooh, I LOVE Ms. Heyer! Prefer the Regencies, but the mysteries are great, too! I collect her first editions. I’ve read them all! I am such a fan of her witty style. I just discovered her last summer. I think my favorites though are her histories. I was so sorry that she died before finishing the 2nd and 3rd books in the My Lord John trilogy. I think I read some of her books a long, long time ago. Kind of gothic, right? Sounds perfect for winter. I remember borrowing a G. Heyer book from my (late) step-mother when I was maybe 13? I loved it, and she complimented me on reading such an “adult” book and understanding it. . .really made me feel proud! What a nice memory! My grandmother used to give me her Barbara Cartland romances to read when I was sick, so I have very fond memories of those. I always inherited my grandma’s Agatha Christies. Probably never would have read them otherwise, which would have been a shame. I really need to broaden my reading again; I’ve boxed myself into a corner. There are so many great books out there! You’ll have fun getting yourself out of that corner. Do try it! The opening is a bit of a jolt, but it’s over soon and the rest of Dandy’s ride is smooth sailing. Why must you do this to me, you purveyor of red herrings? Always writing such fabulous reviews, I forget that the scent in question is Guerlain. I’m sitting firmly on my hands, at least until Rapple announces it to be a disaster, but you’ve made that quite difficult. LOL! I *do* think it smells more like YOUR type of Guerlain rather than mine. Do try at least a sample! With any luck you won’t like it all. Ha, that’s what I thought too. I am no longer allowed to get excited by SL and Guerlain reviews since – no matter how perfect they sound on paper (looking at you, Boxeuses) – the outcome is almost always the same. Meh. I’ll be sure to look up the books, however. Really, if a sample falls into your lap, give it a try! Meanwhile, enjoy the stories. Oh, ditto on the SLs as well. Good to have company in my outcast corner. Angela-Terrific job as always. I wonder if I will fall into the for once category. Love incense and leather. From your article, it seems like your impression of it is that it doesn’t have the loudness of some other Guerlains like say, Samsara. It really isn’t anything like Samsara. It’s much lighter and fresher and more quiet. The fine leather is there for sure, but I don’t get a whole lot of incense. But the juice is purple, I love me an anti-hero, and I am powerless in the sway of violet, so down the rabbit hole I go again. It’s worth a try! It’s really not so thick and sweet as some Guerlains, I think since it was intended as a masculine. Isn’t that funny? He renamed Watson “Wilson”. Whoo- hoo! Guerlain? Cardamom? Leather? Incense? And it is Purple?? This was fluttering on the edge of my awareness but (once I recovered from my swoon :0) I have now tracked down a sample! It should be on it’s way and my wallet is cringing already….Lovely review as always, Angela. Lots of cardamom (I love that note, too). It may not be what you expect, though. Let me know what you think! Hi M, since you like purple juice, have you tried SL’s Sarrasins? It’s a bee-yoo-ti-ful shade (and smells lovely, too). No, Ann, I haven’t – making a note now…thanks! Thanks again for a wonderful review, Angela. Somebody from Guerlain left me a message about a new scent and I couldn’t make out the name, but I think this is it. I’m not at the top of my game right now but the recent open thread about Spring perfumes had me thinking about violets all weekend and I love cardamom fragrances so I’m looking forward to trying this. I think the new one they’re referring to is La Petite Robe Noire Model 2. I received a message from someone at Bergdorf about this. It’s the latest release…along with Cherry Blossom. You’re right. I just received a note about it. I didn’t care for La Petite Robe Noir Model 1 and haven’t read anything about Cherry Blossoms (though “Cherry Blossoms” always reads “Bath & Body Works” to me). I have that same problem. Not to mention the only fragrance I can think of when I think of cherry blossoms is pollen. Thanks for the review! my favorite leblanc – lupin book is “The Crystal Stopper”. Please review the other one if it falls in your hands!!! Hey, I’ll have to look for that one! I don’t anticipate any Voyou coming my way, but you never know. You just have to ask! I have a good sized sample from BG, and will happily pass it on. You are so nice! I’ll send you an email. Maybe we can work out a swap. Rapple – who do you work with at BG? Assuming it’s the one in NY, of course. Hi Angela, thank you so much for a great review. It’s nice to get a “two-fer” review. I get my literary fix and perfume fix all in one stop. I will definitely have to investigate both. Ooooooh. Thanks for the review Angela- sounds like a winner- I am Guerlain fan- so I guess I will have to get ahold of a sniff. Is it good company for the book? It really is good company for the book, especially the old one I have. Love that old book smell. Ooh, old book smell. I love that! Long live books- may the Kindle never win. I agree–Kindle smell just isn’t the same! I just refuse to believe that technology will warrant the same level of long-term affection as books, hand-written letters, and so many of the other “old-fashioned” pleasures in life! I attach real romance to books and handwritten notes. It’s so hard to imagine digital versions taking over. So jealous! Tried this one last Fri and it never moved into unisex territory on my skin but remained formally planted in the masculine zone. Also managed to kill a budding lemming for Boise Torride in that same trip. Ah well… more money available for the Guerlains that I love and who love me back. Sounds like a profitable trip! I haven’t read these books, but they sound remarkably like E.W. Hornung’s Raffles series, which came out around the same time — highly recommended for fans of gentleman thievery! I’ve heard about the Raffles series! I definitely want to read a few. Oh my goodness, Angela. I love cardamom! And, great minds must think alike, because I am wearing my sample today. I wish I could have sprayed it, instead of dabbing it, but I do really like this. My next step may be a decant, although that bottle and that violet juice in the bottle is mighty tempting, heh, heh. But do you love it? How do you really feel about it after you wore it all day? You ask such a good question – do I love it – and I have to say that I like it a lot, but I’m not sure I’d buy a bottle. I think my 10 ml decant will serve me plenty well. I already have a list of bottles I want to buy, but this one probably won’t join the list. I’ll use my decant happily, I just don’t think I’ll buy a whole bottle. Dandy is one of those really nice daily scents to me, but not something that screams to be part of my collection for years on end. But who knows? Maybe when the decant is finished…. Oh! I’m just as desperate to read the books as I am to smell the perfume. I’ve calculated that a Penguin edition of the stories and a small sample of the perfume will cost me about the same. Not sure which to go for first. Thanks for a great review. I’d never heard of Maurice LeBlanc. As for the perfume, by the time I got to violets, fresh and green, my fingers were nearly running their own merry way towards The Perfumed Court. I had to bring them firmly under control, little monsters. The stories are really fun, and so firmly from their time, style-wise. LeBlanc plays little tricks like having the narrator turn out to be Lupin from time to time. Let me know what you think–both of the book and the fragrance! I go wild when I’m sniffing things in a place like BG, and it’s so hard to keep track! If there are cocoa notes, I can just keep on cruisin’ by… thanks for the review and the book recommendation! I don’t know if there is any intentional cocoa, but I do get that effect from it sometimes–so walk on by! It is unthinkable to me that a company such as Guerlain, part of LVMH and who wants to be as global as possible and cover all markets would give a high profile launch such as these two fragrances names that only a native french person can pronounce, or would name them after a “hero” that only the older French generation would remotely remember. I’m sorry but Arsene Lupin’s character is strictly French and the name can only be pronounced correctly by someone who can speak French very well. To add insult to injury, the word “Voyou” is extremely difficult to pronounce by a non-French speaking person as well. I give this duo a year or two before they are “retired” due to these types of terrible mistakes uninformed marketers make. You may be right, but Guerlain has done well with L’Heure Bleue, a famously difficult name for Anglo tongues. I bet most people end up calling this one “Dandy”. Much easier to pronounce if you’re not sure.